More skilled people than me do the same thing far better. There are places locally that really know how to command a wood fired grill. Ox Club in Leeds comes immediately to mind, but the undisputed king of wood-fired cooking is Bittor Arginzoniz, owner and chef of his restaurant, Etxebarri, in a small village an hour southeast of Bilbao in Spain. This is a book about Arginzoniz’s restaurant, and about his approach to both his fire and his food. Some books are worth just having around because they’re beautiful things, articles that make your life richer and enhanced. This is one such book, a heavy, big book of commanding presence and gravity. It’s a serious work, a serious effort, a book that speaks of a passion and a love of simplicity and straightforwardness, qualities to be treasured and guarded. 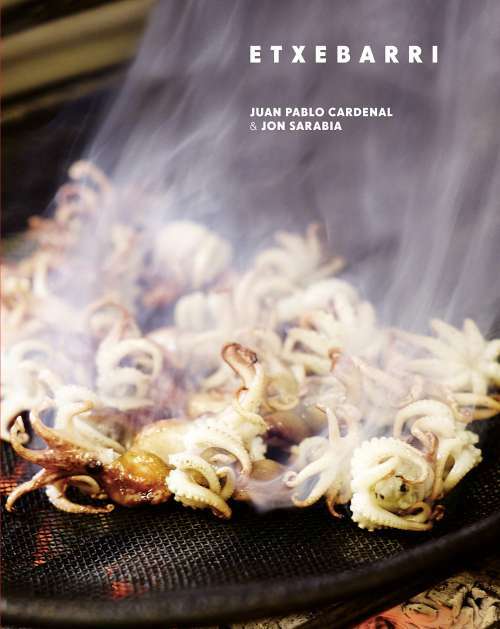 Etxebarri is the story of a restaurant, a chef, and a fire. It’s a simple tale, one of provenance, precision, authenticity, love, a book that describes the elevation of simple fire and simple ingredients into dishes of great inventiveness and heart. The recipes here are not necessarily complex, relying instead on first-rate ingredients, but critically, they require a command of the flame that will defeat me. Arginzoniz is often referred to as The Fire Whisperer, and it’s exactly this ability to control and feel a dancing, living flame that allows him to produce food sometimes described somewhat glibly as ‘the best barbecue in the world’. I was lost in Etxebarri, caught up in its pages. It’s a wonderful book.